Lines on forehead are generally regarded as a normal part of the aging process. Identifying certain wrinkle-causing behaviors and using anti-aging products can help a great deal in countering the signs of aging. This, in turn, promotes a fresh and youthful appearance. Keep your skin hydrated and moisturized. Drink plenty of water and consume foods that contain large amounts of antioxidants. Use moisturizers and creams that contain vitamin E, retinoids and retinol. These ingredients help in producing collagen that naturally covers the facial lines. Always wear sunscreen if you go outdoors. It is advisable to do facial exercises every day. Facial exercises help in stretching as well as toning muscles on the forehead region, thus eliminating the fine lines. Botox is the most favored treatment method for removing forehead lines. It is the most popular nonsurgical cosmetic procedure performed in the United States. Botox refers to a purified form of botulism, a potentially dangerous, paralyzing disease. When Botox is injected into certain targeted muscles, it reduces the appearance of frown lines by disrupting nerve signals and relaxing the muscles.Botox is in fact a relatively fast and easy solution for countering wrinkles. There are minimal side effects and the effect may last for three to four months. Soft tissue fillers or injectable cosmetic fillers are also highly effective alternatives that help to fill the wrinkles and make the skin appear young and smoother. Only certain absorbable FDA-approved injectable fillers such as collagen, hyaluronic acid gel, calcium hydroxylapatite and Poly-L-lactic acid (PLLA) are used for correcting frown lines. Injections are usually administered in a dermatologist's office. Side effects are generally mild and subside within a week or so. The results may last for around six months. 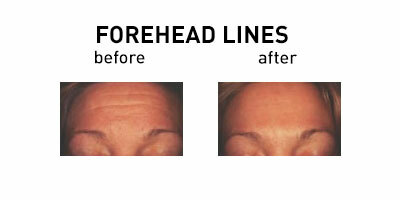 A forehead lift can provide significant results that will last for several years. This procedure could be performed either for repositioning the eyebrows and minimizing the appearance of frown lines, or it can target a specific region. Treating the frown lines usually involves altering or removing the parts of muscles.